Doesn't time pass quickly when you're enjoying yourself? It hardly seems a month has passed by since my last Monthly Musings. As always, I start with a picture of Vampirella. This is the second of my pieces of artwork by Spanish artist, Manuel Sanjulian, whose paintings graced many a cover of the original Vampirella monthly magazines in the 1970's. I wonder if one of the two panthers behind Vampi aren't her friend and ally, Pantha, in her animal form? As is usual these days, this has been another very busy month for me, hobby-wise. My enthusiasm for the new Necromunda sci-fi skirmish game is still very high. I recently finished painting the four new Forge World Bounty Hunters and Hive Scum, so I'll be showcasing them soon. I've ordered second boxed sets of the Escher and Goliath gangs as well as two sets of Orlock gangers. I want to expand the size of my gangs. These new plastic figures offer so much customisation. For the Eschers in particular, I wanted to make some more gangers to use the two weapons included in the boxed set that weren't used by the 10 figures I did make. 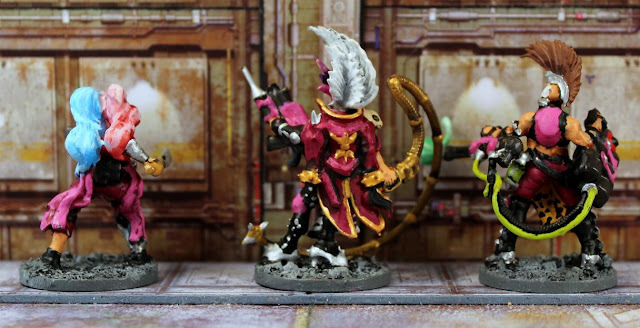 Just as I was thinking about what to do with the other 8 gangers Forge World announced the release of not one but three blister packs of Escher weapons to arm your gangers with. Talk about overkill! There did seem to be a fair bit of duplication amongst the three sets so I only ordered one of them - set 2 if you're wondering which one (see picture to the right). I liked that set best of all because it offered alternative heads as well as weapons. I still have lots more of my old Necromunda metal figures to show you and I will get round to it sooner rather than later. A couple of days ago I received my pack of 200 rare earth magnets from China, and so I will be able to magnetise my scratch-built Underhive scenery and get them all painted. I must admit, I'm not looking forward to painting 60 pieces of scenery, but it has to be done. I'm currently painting the barricades and doors that came with the new starter set box. For my WOIN blog and The Ace of Spades Campaign, I have been digging out some of my old sci-fi figures and rebasing them on MDF bases. I can't wait to show them on my blog but at the same time, I don't want to interrupt what is going on in the Alien Base scenario for my The Ace of Spades Campaign. Playing and writing up this campaign is so much fun. If you are following this scenario, you can see the level of tension mounting as the crew delve deeper into the apparently abandoned alien base. There is a very palatable sense of growing dread. However, what has been taking up most of my time this past month has been my Wild West project. I have made four new buildings, all made of MDF - a sheriff's office and jail, a land office, an undertaker's and a small double storey building under construction. My town is growing. The sheriff's office and jail were produced by TT Combat and the other three by 4Ground. I am also busy making lots of card furniture items for the interiors of my Wild West buildings. I am getting very close to posting my first Wild West batrep. I have also been painting lots more Wild and Weird West figures, which I plan on showing you very soon. I can tell you that my first batrep will feature the Two Hour Wargames rules, Six Gun Sound. There were two versions of this set of rules. The original set, subtitled Blaze of Glory, were highly detailed, which I certainly approved of. The more recent version was much more streamlined and was designed for fast play. What I have done is to take elements from both sets to come up with my own set of hybrid rules. I also designed my own character record sheets, similar to the ones I designed for All Things Zombie. So far, I have created stats for 48 Grunts and Stars, more than enough to get me started. Six Gun Sound will only feature traditional Wild West scenarios. The Weird West stuff will be covered by either Dracula's America, High Moon or Shadows of Brimstone. I like all three sets of rules. This project has been a long time coming and now, at last, it should come to fruition. With today being Good Friday I wish you all a very happy Easter. I'm still sticking with Necromunda for the time being and in this post I want to showcase my original Redemptionist gang who were known as the Triple K Gang. They finished eighth out of twelve when I ran my first campaign. Sadly, I can't put names to any of these figures as the player who ran them kept his gang roster sheet and I didn't get a copy. At the far left is a Redemptor Priest, the leader of a Redemptionist gang. This particular Priest is armed with a Melta-Gun, an Autopistol and a Sword. At the far left is another Redemptor Priest. He is armed with a Hand Flamer and a Sword. For the Redemptionists, the whole of creation is riven with vile corruption that can only be cleansed through blood, faith and fire. In the centre of this group is a special character known only as the Arch Zealot. He is one of the most famous and feared of all Redemptor Priests in the Underhive. He is a mystic and a prophet of the Redemptionist cause, leading a solitary existence in the Underhive. He wanders constantly from place to place, preaching to Redemptionists and whipping them into a state of intolerant fury which almost invariably ends at the very least in a lynching, and more often than not in wholesale slaughter and genocide. His views are considered to be rather - erm - extreme, even by his fellow priests and some would say that he should be banished from the Redemption cause altogether. The Arch Zealot denounces all who voice such opinions as weak-willed traitors, and such is his following amongst the common mass of Redemptionists that those who argue against him either quickly recant or are lynched by an angry mob whipped up into a frenzy of blood lust by one of the Arch Zealot's rabble-rousing speeches. He is armed with a Flamer, a Stub Gun Pistol and a Sword. The Redemptionist gang does not have any heavies. What they have instead are Zealots and Deacons. At the far left are two Zealots. Zealots are crazed individuals touched by the Emperor's fury. They are so filled with bile and anger that they are in an almost permanent state of rage. The most common Zealot weapon is the Eviscerator, a giant double-handed Chainsaw fitted with an Exterminator flame cartridge to slice and burn the unbelievers into charred lumps (for their own good, of course). The Zealot at the far left is armed with such a weapon. His colleague is carrying a Massive Axe instead. Both of them are also armed with Stub Gun Pistols. The Deacons attend to the secular affairs of a Crusade, silencing dissenters, controlling the crowds while the Priest preaches, protecting his person from defilers and so forth. Deacons are confirmed Brethren who are fanatically loyal to the Redemption and completely trustworthy in the Priesthood's eyes. Their faith is rewarded with a position of responsibility and the best weaponry. The Deacon second from the right is armed with a Grenade Launcher and an Autopistol. The Deacon at the far right is armed with a Flamer and a Stub Gun Pistol. The standard gangers of the Redemption are known as Brothers and the juves as Novices. Collectively, they are the Brethren, the great mass of supporters from the Underhive who have dedicated themselves to the path of righteousness. At the far left is a novice armed with a pair of Autopistols and a Sword. Next to him is a brother armed with a Shotgun modified with an under-slung Exterminator (a one-shot Flamer), a Stub Gun Pistol, Frag Grenades and a Flail. 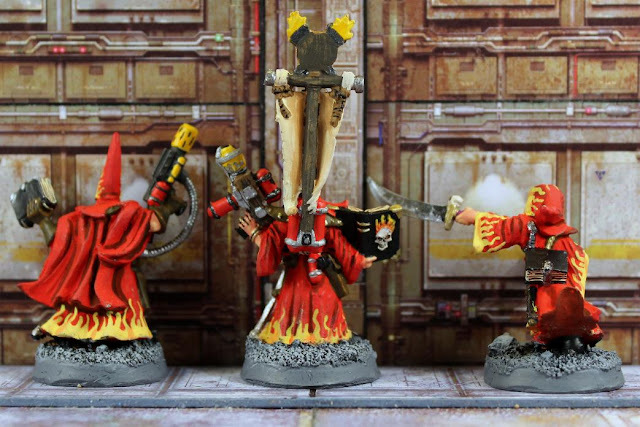 The brother in the centre of this group is armed with a Hand Flamer and a Knife. This figure was a Cultist I converted from the Citadel Chainsaw Warrior range. The brother second from the right is also a conversion. He is based on the brother at the far left in the two photos below. I swapped his Autogun Rifle for a Frag Grenade. He is also armed with an Autopistol and a Knife. At the far left is a novice armed with an Autopistol, a Stub Gun Pistol and a Knife. At the far left is a brother armed with an Autogun Rifle with Exterminator, and a Knife. The next two brothers in line are each armed with a Shotgun, a Bolt Gun Pistol and a Knife. Second from the right, this brother is armed with an Autogun Rifle with under-slung Exterminator, an Autopistol and a Knife. Finally, at the far right is a brother armed with a Hand Flamer, an autopistol and a Knife. The Redemptionists are one of the Outlander gangs and as such, are considered as Outlaws. The Redemption is a powerful force amongst the Houses that control Necromunda, with active or covert followers in all of them. House Cawdor has dedicated itself to the Redemptionist cause entirely and is effectively controlled by the Redemption. There the path of righteousness is at its purest with regular public witch hunts and mass burnings of heretics and mutants. The Brethren of Cawdor are so pure that they view even Redemptionists from other Houses as little better than sinners. The Redemptionists are an interesting gang and I have mixed feelings about them. I like them better than the Cawdors but I dislike all religious fanatics. They are a gang I'd enjoy playing against but they're not a gang I'd want to play myself. 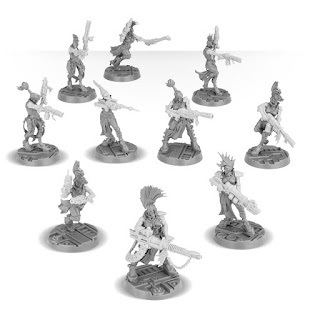 And so I come to the last of my reviews of the six main gangs who appeared in Games Workshop's sci-fi skirmish game, Necromunda and these are the House Delaque gangers. When I ran my first Necromunda campaign in the mid 1990's, House Delaque was the second most popular choice of gang behind House Van Saar. Three of my players chose Delaque gangs and they were called the Emperor's Sons, who finished third out of twelve, the Black Pebbles, who finished fifth and the Long Riders who finished last. Sadly, my players kept their gang roster sheets, so once again, I can't give names to the figures shown. Two of my players used my painted Delaque gang and one bought and painted his own Delaque gang. In this post, I'll be showing my own figures, who were all produced by Citadel Miniatures. At the far left is Kellerman, the Emperor's Sons gang's leader. He is the only person from that gang whose name I can remember. Big Fub from House Goliath and Kellerman had quite a rivalry going on as they frequently traded insults and threats. Kellerman is armed with a Boltgun Rifle, a Slug Pistol, Frag Grenades and a Knife. Next to him is an alternative leader figure, who led the Black Pebbles gang, and he was called Mario Van Pebbles after the actor, Mario Van Peebles. Mario is armed with a Plasma Pistol, an Axe, Frag Grenades and a Knife. Next up are the three heavies. In the centre of the group of five, this heavy is armed with a Lascannon and a Las Pistol. Second from the right, this heavy is armed with a Heavy Flamer and a Lasgun Rifle. The heavy at the far right is armed with an Autocannon and a Shotgun. Citadel produced eight different figures for the gangers but I have ten. The ganger at the far left is a juve whom I converted when he attained ganger status. He is armed with a Lasgun Rifle, a Las Pistol and a Knife. He is based on the third juve in line in the photo below. I cut off his right arm at the elbow, and remodelled it to hold his Lasgun. I also added his pouch that is slung over his shoulder. Next to him is one of the Necromunda hired guns, who looked just like a Delaque. All I had to do to convert him, was to paint him in the same colour scheme as the rest of my Delaque gang. He is armed with a pair of Bolt Pistols and a Knife. In the centre of this group, this ganger is armed with a Lasgun Rifle, a Las Pistol and a Knife. Second from the right, this running ganger is armed with a Shotgun, an Autopistol and a Knife. Finally, at the far right, this ganger is armed with a Lasgun Rifle, Las Pistol and a Knife. Continuing with the gangers, the chap at the far left is armed with a Shotgun, a Las Pistol, Frag and Krak Grenades and a Knife. Next in line, this ganger is another one armed with a Lasgun Rifle, Las Pistol and Knife. The ganger in the centre of the group is armed with an Autogun Rifle and a Knife. The ganger second from the right is firing a Lasgun Rifle, and he also has a Las Pistol and a Knife. The ganger at the far right is firing an Autogun Rifle, and he also carries an Autopistol, Frag and Krak Grenades and a Knife. I finish off with the five juve figures. At the far left, this juve is firing an Autopistol and a Slug Pistol. To his left, this juve is armed with an Autopistol and a Knife. The juve in the centre is armed with a Slug pistol and a Knife. This is the figure whom I converted into a ganger. Second from the right, this juve is armed with a pair of Las Pistols. Lastly, the juve at the far right is armed with an Autopistol and a Knife. The Delaques are a good gang, in my opinion. They specialised in sneak attacks and proved to be worthy opponents in my campaign. I deliberately painted them with dark brown skin to add some ethnic diversity to my gangs as I didn't want all Caucasian gangs. Yet again, these are all very well sculpted and I really love their long coats. I am very curious to see how the new plastic versions will look. Although I have now shown my own figures for the six main Houses, this is not the end of my reviews of my old Necromunda figures. Still to come are reviews of the lesser gangs like the Ratskins, the Redemptionists, the Scavvies and the Spyrers. Plus, there are the bounty hunters, hired guns, psykers and beasts to showcase. Add that lot to the new figures being produced by Games Workshop and Forge World and you can see that I have loads of Necromunda material to keep me busy for a long time. Way back in the mid 1990's when I ran my first Necromunda campaign, the gang that proved most popular with my players was House Van Saar. They were noted for their ranged attacks and access to archeotech gear. Four players chose Van Saar gangs and they were called the Assassins, the Desert Rats, the Cereal Killers and the Van Dams. They had mixed fortunes in my campaign. The Assassins were forced to retire, the Deserts Rats finished fourth out of 12, the Cereal Killers were seventh and the Van Dams were eleventh. My players kept their own gang roster sheets and figures, so in this post I'm going to show my own Van Saar figures but none of them were named and they were never used by me. These are all metal figures produced by Citadel Miniatures. At the left are the two gang leader figures. Both are armed with Las Pistols and chainswords. The chap at the far right also has a Melta-Gun and the figure next to him has a Plasma Pistol. Next up are the gang's two heavies. The ganger second from the right is wielding a Plasma Cannon and a Las Pistol, whilst his colleague is armed with an Autocannon and a Las Pistol. Moving on, we have the regular gangers. At the far left, this ganger is armed with a Bolter Rifle, a Las Pistol and a Knife. Next to him, this ganger is armed with a Lasgun Rifle, a Las Pistol and a Knife. Second from the right, this ganger is armed with a Shotgun, a Las Pistol and a Knife. The white-haired ganger at the far right is armed with an Autogun Rifle and a Las Pistol with a Scope Sight. The ganger at the far left of this group is armed with a Lasgun rifle and an Autopistol. To his left, this ganger is armed with a Shotgun, a Las Pistol, Frag Grenades and a Knife. The ganger who is second from the right is armed with an Autogun Rifle, a Las Pistol and a Knife. The gang's sniper at the far right is armed with a Lasgun Rifle with Scope Sight, a Las Pistol, Frag Grenades and a Knife. Finally, are the gang's six juves. The juve at the far left is armed with an Autopistol and a Club. The next two in line are armed with a Las Pistol and a Knife. These are both the same figure but I repositioned the arms of the one third from the left. The juve third from the right sports a pair of Slug Pistols. To his left, this juve holds a Slug Pistol and an Autopistol. Finally, at the far right, this juve is armed with an Autopistol and a Knife. As is usual with these original Necromunda figures, they are all extremely well sculpted. I can certainly see the appeal of this gang but their style of play didn't suit my own tactics. Despite there being four Van Saar gangs in my old campaign, I can't remember any outstanding moments with any them. They were rather bland. I honestly can't remember the names of any of their leaders. Sure, they were great at ranged combat and generally reliable but they all lacked personality. Whilst I never got to use this gang myself in my Necromunda campaign, a couple of my players used them instead of going out and buying their own figures. This was quite common with my group! However, those of you who follow my WOIN blog, will recognise these figures as the mercenary company led by captain Erik Finn in my Raid on Sterling scenario. I have just seen previews of the newest Van Saar gangers that are coming out soon for Necromunda: Underhive and I must admit, I am very impressed with them. What pleased me the most was the fact that they feature male and female gangers in the set. That's a first for a Necromunda gang! I'll definitely be buying them as soon as they are released... but not from Games Workshop! Why pay their prices when other companies offer them for 20% cheaper? In my last two posts I showcased my favourite Necromunda gang - House Escher. In this post I'm going to review my least favourite gang - House Cawdor. They fared very badly in my old campaign from the 1990's. They were used twice in my campaign. One of my old gaming buddies, Ken, used them at the start of the campaign and took such beating that he was forced to disband them and take a new gang. He then chose the Redemptionists, who were even more religiously fanatical than the Cawdors. Halfway through the campaign, when most of my players were taking second gangs to start with because their first choices had became so powerful, I decided to have a go with House Cawdor to see if I could do better than Ken. I lost nine out of my ten fights. Oh dear! Basically, I think that House Cawdor are crap! This is my House Cawdor gang that I'm showing and they were laughably called the Punishers. The Punished would have been a more appropriate name! At the far left is Brother Coromell, a gang leader figure, who was used as an ordinary ganger because I much preferred the other gang leader figure. What was I thinking?! Coromell is armed with a Bolt Gun and a Power Sword. Standing next to him is Father Paraden, the gang's first leader. He was such a disaster that another ganger challenged him for the leadership of the gang, and unsurprisingly, beat him. He would often get wounded and miss the next fight, which did not endear him to the other men in his gang. Paraden slunk off into the wastelands and was never heard of again. As shown, he is armed with a Bolt Gun, an Autopistol and a Chainsword. Next up are three heavies. In the centre of this quintet of figures is Big Brother Dupaynil, who is armed with a Heavy Stubber, an Autopistol and a Knife. He was not used in my campaign. Note that all of my heavies were called Big Brother instead of Brother. Second from the right is Big Brother Argray, who ended up being captured by House Escher. No rescue mission was made to recover him, so who knows what his fate was? It doesn't bear thinking about! He was armed with a Heavy Bolter, an Autopistol and a Knife. At the far right is Big Brother Gerstan, who is armed with a Grenade Launcher, an Autopistol and a Knife. His Grenade Launcher could fire Frag, Krak or Hallucinogenic Grenades. He ended the campaign with a serious leg wound. Moving on, we have the rank and file gangers. At the far left is Brother Quinada, who is armed with a Lasgun Rifle, an Autopistol and a Knife. Next to him is Brother Sanborn, armed with an Autogun Rifle, an Autopistol and a Knife. He was not used in my campaign. Nor too was the next ganger in line, Brother Garley, who was armed identically to Brother Sanborn. Second from the right is Brother Ingrich, who is armed with a Lasgun Rifle, an Autopistol and a Knife. He was another figure who did not appear in my campaign. At the far right is Brother Currald, who is armed with an Autogun Rifle, an Autopistol and a Knife. The sharp-eyed amongst you will recognise him as an old Grenadier Scavenger figure, who is now available from EM4 Miniatures as Scavenger with Assault Rifle. You have to admit, he does look just like a Cawdor ganger. Continuing with the gangers, here we have Brother Dallish at the far left. He was armed with a Shotgun, an Autopistol and a Knife. Note the deliberate use of the past tense for describing his weapons. In a fight against a Van Saar gang, he was ambushed by an unseen monster and devoured! That was a most unusual way to die! Second from the left is Brother Klepsin, who is armed with a Lasgun Rifle, an Autopistol and a Knife. He was not used in my campaign. Second from the right is Brother Tollwin, who is armed with a Lasgun Rifle, an Autopistol and a Knife. He suffered a head wound and at the start of each fight he had to roll 1d6. On a roll of 1-3 he acted Stupid and on a 4-6 he would Frenzy. Last in line is Father Follard, formerly known as Brother Follard. He was the ganger who challenged Paraden to the leadership contest. In the Punishers' eighth gang fight, Paraden was once again absent, recovering from a wound. Follard, as the most experienced ganger, took command against the House Orlock gang, Murder Inc. and achieved the Punishers' one and only victory of my campaign. He is shown armed with a Shotgun, an Autopistol and a Knife. When he became gang leader he bought a Chainsword as well as Frag and Krak Grenades to add to his personal arsenal. Finally are the gang's juves. At the far left is Little Brother Varian (yes, the juves were called Little Brothers). He is armed with an Autopistol and a Knife. Next to him, Little Brother Tailler is also armed with an Autopistol and a Knife. He was not used in my campaign. At second from the right is Little Brother Billis, who, once again is armed with an Autopistol and a Knife. He was not used either. Last up, is Brother Paskutti, who managed to attain ganger status and thus dropped the "Little" from his title. He is armed with a Plasma Pistol and a Sword. Note that he is a converted figure. He was originally armed with a Slug Pistol, which I cut off and replaced once he became a ganger. Despite my antipathy towards this gang, these are all nicely sculpted figures. As I said at the start, the two Cawdor gangs that took part in my campaign suffered an unbelievable amount of defeats. Ken's gang was so badly battered, with so many wounded gangers missing from action, that he sensibly disbanded it to begin afresh with a new gang. I thought I could do better. After all, my Escher and Goliath gangs finished in first and second place in my campaign, so I was a good player, but I just couldn't get a break with this gang. Not only did they lose nine of their ten fights but three of their five territories were taken from them by other gangs. That was just so pathetic! Clearly, my experience of this House has clouded my judgement of them. But quite frankly, I'd rather play any other gang than a House Cawdor gang. That said, I am curious to see how they fare in the new Necromunda rules. It's hard to imagine how much worse they could be! Following on from last week's well received post about my original House Escher gang for Necromunda, I now turn my attention to my latest Escher gang, made up of the ten multi-part plastic figures found in the new boxed starter set. I didn't encounter any problems in making them. Some people have complained that they are too fiddly and I can see that that might be the case for some, but I actually enjoyed making them. Once that was done, I painted them all. The default name for them was the Carrion Queens, which I almost used but seeing as I went for a totally new colour scheme I named them the Pink Pouncers instead. At the far left is Black Friday, my limited edition Escher ganger that I procured from TT Combat. I did show her in a previous post but she has undergone a few slight changes to her paint scheme. I have given her a white face and changed the colour of her knee-pads from silver to pink. She is armed with a Sawn-Off Shotgun and a Power Sword. Her white face makes her look even more like Harley Quinn, which is deliberate. For the rest of the gang I have given them the names assigned to them by Games Workshop. In the centre of this trio is Jelena, the gang's leader. She is armed with a Combi-Bolter and Needle Rifle and a Shock Whip. She wears Flak Armour, as do all of this gang. This gives a 6+ save but grants a 5+ save against weapons that use the Blast template. At the far right is Tumala, a Champion who is armed with a "Nightshade" Chem Thrower and a Stiletto Knife. She is the gang's heavy weapons specialist. At the far left, Marika is also a gang Champion. She is armed with a Plasma Pistol and a Stiletto Knife plus Choke Gas Grenades and Krak Grenades. Next to her is Rhosinn, who is armed with a Las Pistol and a Power Sword plus Choke Gas Grenades. Next in line is Zarann, who is armed with a Las Pistol and a Stiletto Knife plus Choke Gas, Frag and Krak Grenades. At the far right is Nokomi, who wields a pair of Las Pistols and has a Stiletto Knife in a scabbard at her right side as well as Choke Gas Grenades. Moving on, is Olina, who is armed with an Autogun Rifle, a Stiletto Knife, Choke Gas Grenades and Frag Grenades. Orange-haired Reina is armed with a Lasgun Rifle, a Stiletto Knife, Choke Gas Grenades and Frag Grenades. Brae, who is second from the right, is only armed with a Lasgun Rifle and Choke Gas Grenades. Finally, is Kaiya, who is carrying a Lasgun Rifle and a Stiletto Knife. As a massive fan of House Escher, I have to admit to liking these figures. So much so that I have ordered another boxed set of them so I can expand my gang. There are weapon options on the sprues that were not used here - Grenade Launchers and Shotguns, for example. 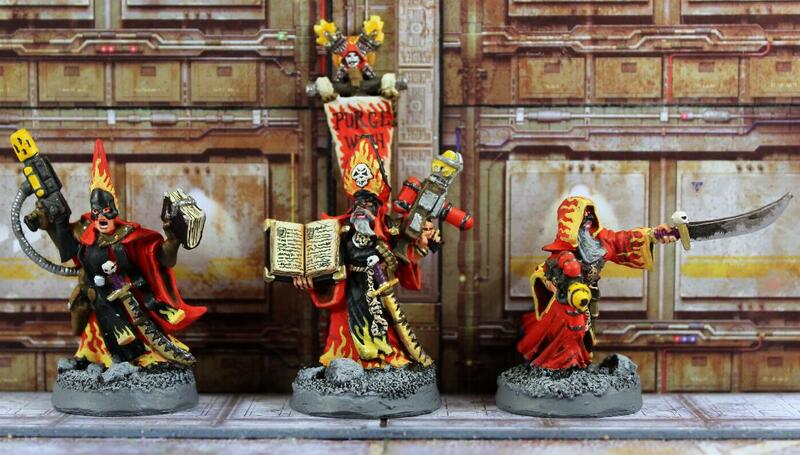 I still think that the original metal Escher gangers were better but these are not bad at all. These new Eschers are chunkier and more muscular but they do have far greater conversion potential and can be put together in near infinite ways. Now that I have these and my new Goliaths painted up, there is nothing stopping me from getting in a few games, which I'll post up on this blog. At the far left is a ganger called Angela Santiago, who is armed with an Autopistol, a Power Sword and a Knife. This was one of the two leader figures provided but I much preferred the other one so this figure became a standard ganger. Next to her is actual gang leader, Catherine "Cut-throat" Kurtz. She was an incredibly successful leader, who in her first seven gang fights won every one! That impressive achievement went unequalled in my campaign. She is armed with a Plasma Gun, a Las Pistol, a Power Sword and a Knife. Check out her rainbow coloured hair, which I love! This gang is so colourful! To her left is Corisande Gothique, another ganger and the gang's medic. She is armed with a Las Rifle, a Shotgun, a Power Sword and a Knife. I should mention that she was not an official Escher figure, but an old Citadel Rogue Trader figure whom I drafted in. I added the Power Sword to her from my spare parts box. To me, she just looked like she should be an Escher ganger. Next in line are the gang's three heavies. Third from the right is Sabrina Wilde, who is armed with a Heavy Plasma Gun, an Autopistol, a Short Sword and a Knife. She was hard as nails and a stone cold killer! To her left is Dee Dee Deathbringer, who is armed with an Autocannon, an Autopistol, a Short Sword and a Knife. This gang was unusual in that had two heavies on its roster. The heavy at the far left is Nadia Mendoza, armed with a Las Cannon, a Las Pistol and a Knife. She was not used in my gang. She is another non-official Escher figure. Originally, she was an Imperial Guards-woman. Yes, in those days Citadel did make female Imperial Guardsmen. Why they don't now still baffles me. This figure was not converted in any way, merely given an Escher style paint job. I like her a lot. Next up are the first six of twelve official metal Escher gangers. I don't know why, but back then Citadel produced more metal gangers for House Escher than any other gang... not that I was complaining! These six gangers specialised in ranged combat. At the far left is Venecia Secura, who is armed with a Shotgun, Autopistol and Knife. She was not used in my gang. Standing next to her is Annabelle Armalite, who is armed with an Auto Rifle, a Silenced Autopistol and a Knife. Third from the left is Juliette Delacroix, who is armed with a Las Rifle, a Las Pistol, a Short Sword and a Knife. The ganger with the mint green hair is "Shotgun Shelagh" O'Shaunessy who is obviously armed with a Shotgun, as well as a Short Sword and a Knife. Orange-haired ganger, Zoe Sussido, is armed with an Auto Rifle, a Las Pistol and a Knife. At the far right is Melissa Nightingale, the gang's best sharpshooter, who is armed with a Las Rifle with Telescopic Sight, a Las Pistol and a Knife. Whenever I was setting up my gang I'd always try to place her on the highest point possible. This next batch of gangers all excelled at melee combat. At the far left is Kirsten McCoy, who is armed with an Autopistol, Frag and Krak Grenades, a Sword and a Knife. I'm not sure, but I think she was the only Necromunda figure who was sculpted holding a Grenade. Next to Kirsten is Fiona DeVille, who is armed with a Las Pistol, a Flail and a Knife. The Flail is a most unusual weapon in the Underhive. Third from the left is Siobhan Sawyer who is armed with an Autopistol, a Chainsword and a Short Sword. Third from the right is Pomayla Jatarri, who is armed with a Plasma Pistol, a Club and a Knife. To her right is Gabrielle Swiftsword, who is naturally armed with a Power Sword, an Autopistol and a Knife. She was the gang's best close combat fighter. Only Catherine, the gang's leader, earned more experience than her. Finally, is Jade Maskarra, a new recruit to the gang. She is armed with a Las Pistol, two swords and a Knife. Finally, we come to the juves. At the far left is Becky Buck, who became a highly skilled ganger and infiltrator. She is armed with an Autopistol with Silencer, a Pick and a Knife. Her colour scheme was loosely based on the comic book heroine, Tank Girl, whom I thought she resembled. Next in line is Hoso Purdey (oh, so pretty, geddit?) who is armed with an Autopistol, a Club and a Knife. She was not used in my gang. Neither was the next juve in line, Salma Cruz, who is armed with an Autopistol, an Axe and a Knife. Note that I added her glasses. This next juve, Carryanne Fairchild, is not a Citadel figure. I can't remember who originally sculpted her but she was heavily converted by me. I added her shoulder pad, twin MAC10 Machine Pistols (which I classed as Autopistols), her ammo pouch, her tiger print loin cloth and her boots. Given that amount of work on her, she was used in my gang but was added much later in the campaign, so she never advanced beyond juve status. Second from the right is Kayrin Rasavi, who is armed with an Autopistol and a Knife. She was not used in my campaign. Nor was the final figure in my collection, Rula Villaseca, which is a shame. I love this sculpt. The way she is clearly struggling to hold that massive Plasma Pistol is just so cute. She is also armed with a Knife. When I played with my Badland Bastards Goliath gang, I never cared whether I won or not. I just wanted to have fun with them. But with Catherine's Cut-throats, this was my favourite gang and I so wanted to succeed with them the most. These were my babes. I put my heart and soul into painting them to the very best of my abilities. Luckily, I did extremely well with them They finished top of my league when my old campaign drew to a close. When I started out with this gang, one of the first things I did was to hire a bounty hunter to aid them in their first few games. Her name was Amazonia Gothique, elder sister of Corisande. The experience and high stats she provided made a big difference in those early games and I was surprised so few other players didn't follow suit. I'll show you Amazonia in a latter post. She left after five games, by which time my gang had earned plenty of experience. Such was the reputation of Catherine's Cut-throats that late on in the campaign, they were awarded Watchmen status, a high honour indeed. Here I showcase all of my original House Orlock gangers, some of which were used in my friend Neil's Murder Inc. gang when I ran my first Necromunda campaign in the mid-1990's. I start with four metal gangers produced by Citadel Miniatures. At the far left is Danny "The Kid" Orson, who is armed with a Shotgun and a Knife. He started out as a juve and got promoted to a ganger, hence his nickname. He ended up being the gang's medic. Next up is Dean Cray who is armed with a Las Rifle, a Las Pistol and a Knife. Third in line is an unnamed ganger who was not used in my campaign. He is armed with an Autogun, a Las Pistol and a Knife. The ganger at the far right was also unnamed and unused. He is armed with an Autogun and a Slug Pistol. Note that he is the only ganger who is wearing a leather jacket instead of a leather waistcoat. I don't know why Neil never chose him. I would have made him my second in command. Moving on, at the far left is Andreas "Hitman" Kazlowski, who is armed with a Las Rifle, an Autopistol, Frag Grenades and a Power Maul. He was the most experienced ganger in Murder Inc. Next to him is Jamie Jacobs, who is armed with twin Autopistols, Smoke Grenades and a Knife. His second Autopistol is in a holster hidden by his right arm. You can just spot it in the picture below. Second from the left is Damian Cray, the twin brother of Dean. Just like his brother, he is armed with a Las Rifle, a Las Pistol and a Knife. At the far left is another unnamed and unused ganger. This chap is armed with an Autogun and a Club. The following twelve gangers are all plastic figures, that came with the boxed starter set. These all had separate right arms holding an assortment of weapons. Only the ganger at the far left was named and used in Murder Inc. He is Andy Johannsson and he is armed with a Shotgun, Las Pistol and Sword. His sword came from one of my Goliath gangers' sprues and replaced his knife. The Goliath ganger got his Knife. Seeing as the other five gangers were not named or used I'll just mention how they were armed. From left to right we have a Slug Pistol and Knife, an Auto Pistol and Knife, a Bolt Pistol and Knife, a Las Pistol and Knife and another Las Pistol and Knife. These next six gangers were also unnamed and unused. At the far left I slightly converted this ganger to hold an Auto Pistol. He also has a Knife. The next two gangers are armed with a Shotgun and Knife and an Autogun and Knife respectively. The three gangers at the right are armed with an Autogun and Knife and the two at the far right are each armed with a Las Rifle and a Knife. The eight metal gangers are very good figures and are well sculpted. The plastic gangers are far inferior. Sure, they give you numbers but quality has been sacrificed for quantity. The new plastic Orlock gangers are in a different league and show just how far advanced the production of plastic figures has come since the mid 1990's. To me, the Orlocks were a gang with no great strengths but no great weaknesses either. In my original Necromunda campaign they finished ninth out of twelve, losing more games than they won.